Gluten quality refers to the contribution of gluten-forming proteins – gliadin and glutenin – of different cereals (and their dry processed, milled and sprouted products) to the rheological and other handling properties of yeast-leavened bakery products. 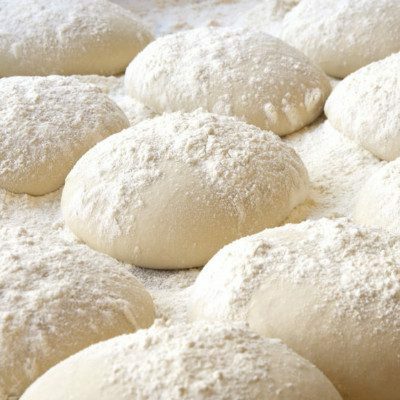 In order to obtain a good bread volume, the dough structure provided by gluten should be able to entrap the carbon dioxide produced by yeast cells and expand during fermentation. Gluten is a heterogeneous mixture of high molecular weight proteins, prolamin (gliadins) and glutelin (glutenins). Both have very limited solubility in water. Upon their encounter with water and subsequent mixing, they form a continuous macromolecular viscoelastic network within the dough that is capable of entrapping gas during fermentation. Prolamins (gliadins, α,β,γ and ω fractions)(gluten-forming, soluble in alcohol solutions) 33 (of total protein)30–45 (of total gluten) 30,000–50,000 Da Essential components for dough extensibility and viscoelasticity. 70–55 (of total gluten) High molecular weight (90,000 to 10 millions Da)Low molecular weight < 90,000 Very large molecules made up of individual subunits (heterogeneous polypeptides) connected by disulfide bonds. They confer dough elasticity and resistance to deformation. Residue 33 of total protein – Protein left after dissolution with solvents. Gluten quality is not only limited to wheat. There are other cereals that provide gluten-forming proteins and as a consequence, can be used for production of breads on their own or combined with wheat. When alternative cereal ingredients are used in bread and other bakery formulations, their impact on wheat proteins should be addressed. In most cases, bakers know about gluten quality as baking quality. This is because gluten is essential in breadmaking operations which represent the largest market share. Besides chemical analysis (compositional- and molecular-focused), gluten quality can be assessed by using dough testing instruments. Such devices rely on the rheological behavior, mechanical response and water interactions of flours (and the respective doughs). Shewry, P.R., et al. “Wheat Grain Proteins.” Wheat Chemistry and Technology, 4th edition, AACC International, Inc., 2009, pp. 223–278. Finnie, S., and Atwell, W.A. “Composition of Commercial Flour.” Wheat Flour Handbook, 2nd edition, AACC International, Inc., 2016, pp. 31–40. Rosell, C.M. “Bread: Chemistry of Baking.” Encyclopedia of Food and Health, volume 1, Academic Press, Elsevier Ltd., 2016, pp. 484–487. Damodaran, S. “Amino Acids, Peptides, and Proteins.” Fennema’s Food Chemistry, 5th edition, CRC Press, Taylor & Francis Group, LLC, 2017, pp. 318–321.